Maryland Politics Watch: Election Law Broken in District 4? Election Law Broken in District 4? 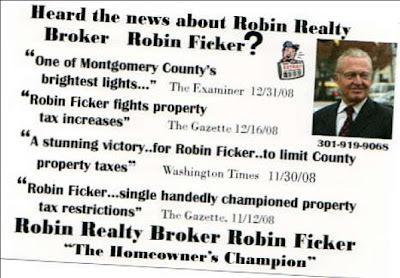 Flyers advocating for Robin Ficker that have been recently distributed in District 4 indicate a possible violation of Maryland's election law. (ii) as to campaign material published or distributed by any other person, the name and address of the person responsible for the campaign material. 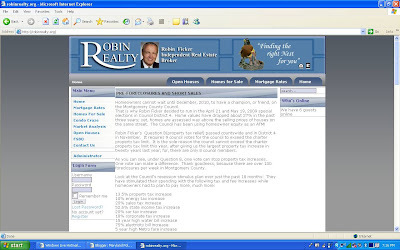 (2) The authority line may omit an address that is on file with the State Board or a local board. (3) If the campaign material is too small to include all the information specified in paragraph (1) of this subsection in a legible manner, the authority line need only contain the name and title of the treasurer or other person responsible for it. (4) The authority line for campaign material that is a commercial advertisement need only contain the information specified in paragraphs (1) and (2) of this subsection for one campaign finance entity or other person responsible for the advertisement. "This message has been authorized and paid for by (name of payor or any organization affiliated with the payor), (name and title of treasurer or president). This message has not been authorized or approved by any candidate." 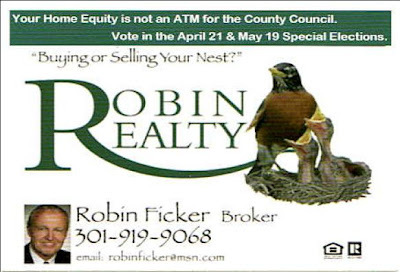 These flyers, which explicitly urge recipients to vote in the special election, look like campaign materials and not exclusively advertisements for Ficker's realty business. Therefore, they must contain an authorization line. 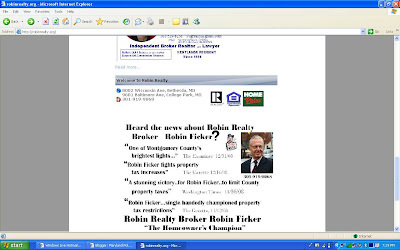 And as of this writing, Robin Ficker's website - which contains copies of the flyer in question - also lacks an authorization line. See the four screenshots of the website below. 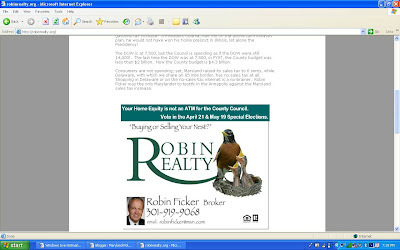 As a lawyer and someone who has run for office numerous times, Robin Ficker should know better. Maybe We Can Save The Orioles? What Do Adam Pagnucco and Prison Have In Common?